The first thing we see onscreen in Hereditary is a newspaper obituary for the elderly matriarch of the Graham family, telling us she is survived by her daughter Annie (Toni Collete), son-in-law Steve (Gabriel Byrne), and grandchildren Peter (Alex Wolff) and Charlie (Milly Shapiro). This nicely sets the tone for the eeriness of everything that follows, as the family slowly unravels following her death. This is one of those horror movies where we know things are off right from the opening scenes, but it takes its time to reveal exactly what is happening, slowly building tension along the way. We know something deeper is going on with this family when Annie delivers an icy eulogy at her mother’s funeral, seemingly struggling to find enough nice things to say about the woman who raised her. It quickly becomes apparent that the whole family was somewhat estranged from the dearly departed, save for little Charlie, who seems to have shared a special bond with her. After the funeral, Charlie’s morbid fascination with death become cause for concern, with her behaviour growing increasingly weird both at home and school. It’s revealed early on that Annie has a history of severe mental illness in her family, which leads to some question of whether this is all part of her own mental breakdown, but it quickly becomes apparent that there are also dark forces at work trying to sink their claws into the entire family. So when Annie meets a charismatic older woman named Joan (Ann Dowd) at a local grief support group, who encourages her to try a seance in order to get back in touch with the deceased, all hell starts to break loose. The film begins as an unsettling family drama that provides an eery study of the grieving process, before blossoming into a full-fledged supernatural horror movie that has heavy undertones of Rosemary’s Baby, and for the most part it’s a smooth ride. There is a truly shocking event that happens about forty minutes in – which I wouldn’t dare think of spoiling here – that completely upends where we think the story is going, and it’s this bait and switch that provides one of the most interesting aspects of Hereditary. First off, it has to be said that this is a supremely accomplished debut feature from writer-director Ari Aster, who crafts a tense horror experience that takes several risks while also wearing its cinematic influences proudly on its sleeve. The film not only shares DNA with Rosemary’s Baby, but also calls to mind other classic possessions films like The Exorcist and The Omen as well. Pawel Pogorzelski’s cinematography really helps set the tone, often slowly panning around different rooms in order to build tension, and the sound work is equally effective at helping the film get under our skin. The production design is also impressive, with the miniature models that Annie makes and sells as an artist providing micro versions of the full-scale sets, which are used as a cool narrative device. Toni Collette commits herself fully to the role and delivers some of her finest work, tearing up the screen as a woman being pushed increasingly over the edge as she tries desperately to keep both her family and her sanity together. I was also really impressed with Alex Wolff’s performance, as he shows off some serious acting chops here as a teenager being thoroughly put through the ringer both by his family and forces beyond his control. The young stage actress Milly Shapiro manages to deliver an impressively unsettling performance in her first onscreen role, providing a memorable addition to the long list of creepy kids in horror movies. 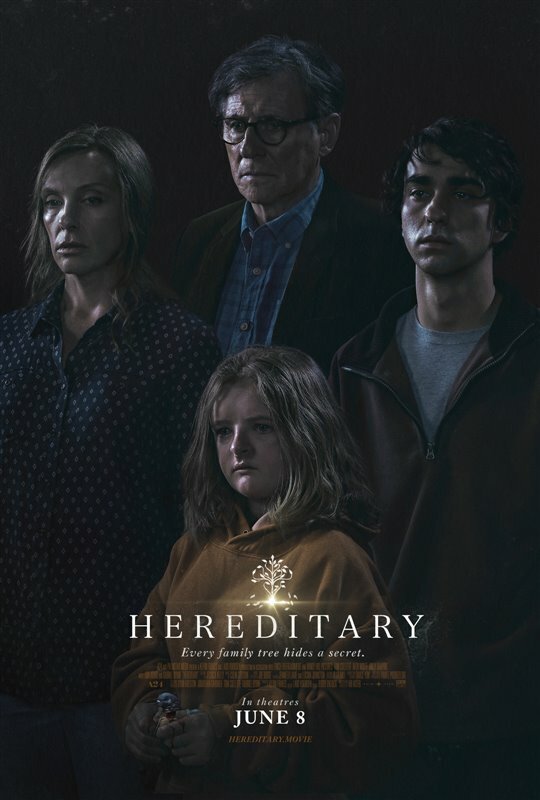 My one complaint about Hereditary comes from the fact that, since it premiered at Sundance, the film has been heavily hyped as one of the scariest movies ever made, and I think that’s overselling it by a pretty wide margin. While the film is suspenseful and unsettling to be sure, I also wasn’t really scared by it, and once we realize where it is going, it turns into a pretty typical horror movie that is easy to predict where it will end up. Maybe I just have a higher tolerance for these sorts of things. Still, Hereditary is a very confidently made slow-burn horror movie that focuses much more on setting a tone then it does on delivering constant jump scares, and is all the stronger for it. The film is carried by several standout performances from its cast, features arresting cinematography, and unfolds with a creeping sense of dread throughout much of its running time.